Our economy is fundamentally broken for many, many people. Look at the chart below. The dark blue line – “Productivity” – shows the growth of our economy’s productivity since 1948. The light blue line – “Hourly compensation” – tracks how wages have changed for production and non-supervisory workers in America. For twenty-five years, as our economy became more productive, wages went up for everybody, including workers. And then, starting in the 1970s, something went wrong. This trend accelerated during the Reagan administration and has since exploded. 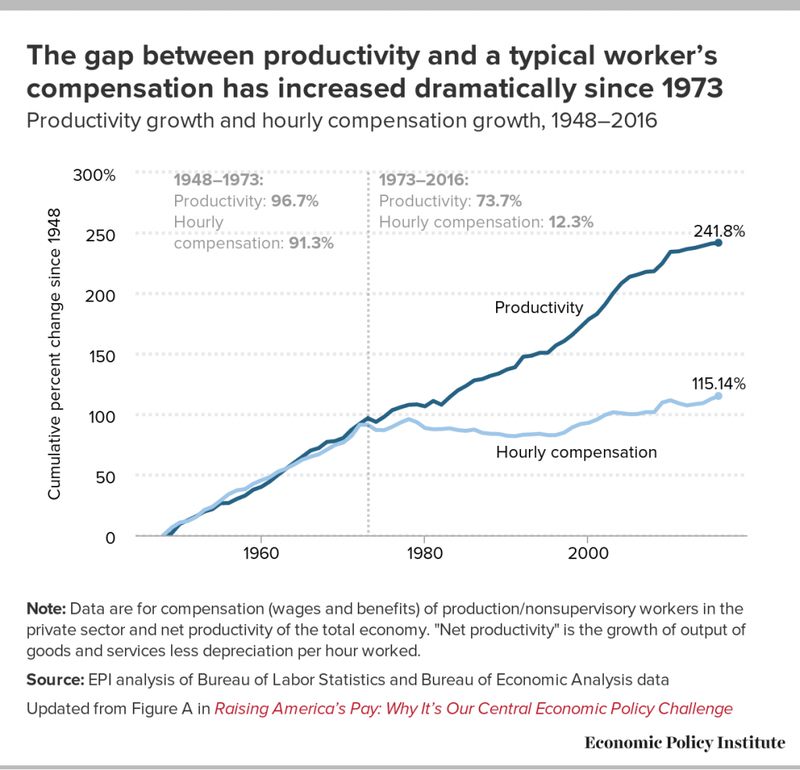 Since 1973, total productivity has grown by around 75% — and hourly wages for production workers has gone up by 12%. Put another way, since 1973, as our economy has gotten more productive, the boss gets $5 for every $1 non-supervisors get. Does that seem fair to you? You can find more information like this at the Economic Policy Institute. Collective Bargaining Justice — One reason why productivity and wages became unlinked was because of the all-out war against organized labor. This fight came to Iowa after Republicans won in 2016 and gutted collective bargaining rights for state workers here in Iowa.  Public sector unions are one of the last, strong vestiges of organized labor in our entire state. Making sure they can bargain effectively is critical in order to raise upward pressure on wages for all Iowans and to set a baseline of standards for occupational safety and support. Solidarity matters. A Living Wage for All Workers — Another reason hourly wages aren’t keeping up is obvious: we aren’t giving workers a raise. In 2015, the Johnson County Board of Supervisors voted to raise the minimum wage to $10.10 by 2018. 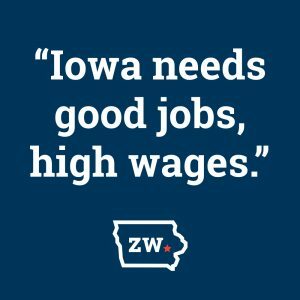 After the 2016 elections, Iowa Republicans specifically targeted Johnson County and passed a law to roll back our county’s wage increase. This is only the latest example of Republicans supporting “local control” only when they like what’s happening. We need to reverse that law, get the minimum wage back on its path to $10.10 as quickly as possible, and continue to increase the wage as the cost of living goes up. For more information, check out the charts and analysis I posted on Medium.